DISCOUNT LOCKSMITH - "LOCK INTO SECURITY"
Discount Locksmith is your one stop shop for all of your security products. We offer a professional locksmith service for Corpus Christi and surrounding areas such as Port Aransas, Aransas Pass, Portland, Beeville, Kingsville, and everywhere in between. 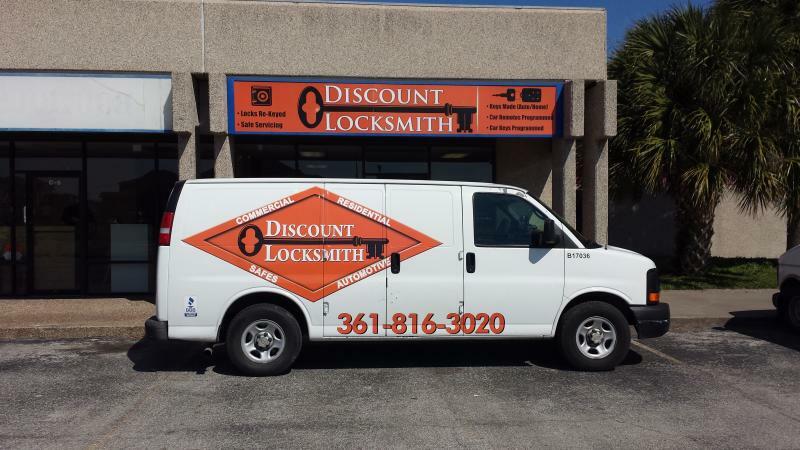 Discount Locksmith was founded in Corpus Christi and understands the security needs for the area. All of our locksmiths undergo a background check and are licensed through the State of Texas DPS. We offer a wide range of products to suit your business, residential, or automotive needs, as well as professional installation. You will find exceptional prices, on quality products. We believe customer service is the key to building clients, and maintaining a lasting relationship with our customers. Discount Locksmith services all of Corpus Christi and surrounding areas for all your locksmith needs. If you have any questions about the services we provide, feel free to contact us.